Recep Tayyip Erdogan’s authoritarian response: Turkey’s prime minister is not interested in compromising with the country’s protesters. Turkey’s prime minister is a popular, democratically elected leader—who rules with the back of his hand. 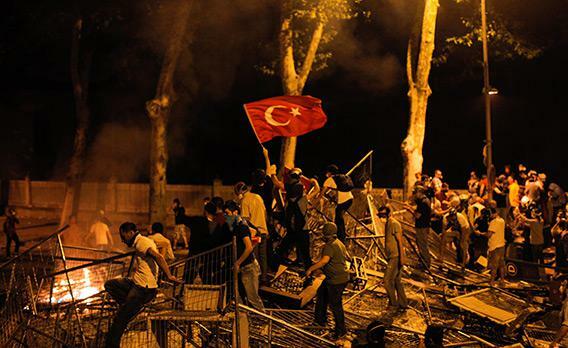 Protesters clash with riot police betweenTaksim and Besiktas in Istanbul, on June 1, 2013, during a demonstration against the demolition of the park. Turkish Prime Minister Recep Tayyip Erdogan’s woes are looking positively Byzantine at the moment. Back in 532, Constantinople faced what would become one of the worst popular revolts in history: The Nika riots burned down half the city, left tens of thousands dead, and almost led to the ouster of Emperor Justinian—and it all started over something as relatively benign as chariot racing-inspired hooliganism. Nearly 1,500 years later, Istanbul once again faces a relatively minor protest that has ballooned into a far-reaching political stand-off—although thankfully nothing as violent as those earlier riots. What started as a relatively simple Occupy-style sit-in last week in defense of one of central Istanbul’s last remaining green spaces—authorities wanted to bulldoze a park to make way for yet another shopping mall—has turned into a nationwide riot against Erdogan’s authoritarian brand of democracy and his desire to shift Turkey’s image closer to Islam. Yet no matter how much the famously obstinate prime minister tries to dismiss the protesters in the Taksim neighborhood as anti-progress, tree-hugger rabble, and no matter how much the Turkish media tries to stick its head in the sand, this wave of protests has become an opportunity to criticize everything despised about Erdogan’s vision for Turkey. And like any leader unflinchingly certain of his mandate, Erdogan does not take kindly to those who disagree. So it wasn’t surprising when the protesters who assembled in Taksim Gezi Park started being harassed by the police almost as soon as their peaceful sit-in began last Monday. Much like Occupy back in 2011, the relatively left-leaning, upper-middle-class protesters were immediately surrounded by a phalanx of police officers; pictures emerged of college types smiling, sharing food, some even reading books to the bored officers who were dispatched to the scene. But the calm ended on Friday, when orders came to crack down on the growing number of supporters using ample tear gas, water cannons, and the occasional rubber bullets. What followed was a weekend when it was hard to walk anywhere in central Istanbul, or even to just sit in one’s own apartment, without your eyes welling up from tear gas. As of Friday, immense crowds tens of thousands deep began marching to the city’s central Taksim Square shouting slogans calling for Erdogan’s resignation while holding up clever signs against the government and the police. While protesters were understandably anxious about how the government might react, they were also joyous about overcoming a decade of political impotence—after all, the protesters had accomplished in a week what the main opposition party, the Republican People’s Party hadn’t been able to do in 11 years: show the limits of the ruling party’s power. Such sentiments of camaraderie and optimism were widespread over the weekend. When one hit upon a particularly strong gust of tear gas on the way to Taksim, strangers would rush up with spray bottles of antacids dissolved in water to counteract the burning. One young man found a box of unused tear gas canisters and a group quickly formed around him, helping open up a manhole cover and tossing the entire crate into the sewer. Everyone helped one another across barriers, freely offering their food and water to those in need. Those not on the street banged pots and pans in support from their windows, their clanking sounds as ubiquitous as the blunt explosions of the tear gas canisters, which were still being fired well into Monday evening. While the protesters come from a broad range of ages and ethnicities, they are almost exclusively secular Turks, those who feel increasingly alarmed by the ways in which Erdogan and his government have begun to blur the lines between political and religious life. Which makes sense when one considers the reason why the Taksim protest started in the first place: The neighborhood is the heart of Istanbul’s secular life with its countless bars, cafés, bookstores, and nightclubs. Turkey’s religious element, Erdogan included, have long expressed a desire to make the area more “family friendly”—code for mosques and malls. The image of a mosque looming over Taksim Square has been a boogeyman for secular Turks for decades. While public outcry has been enough to shelve any mosque plans to date, Erdogan’s decision to tear down the park and replace it with a replica of an Ottoman-era barracks, complete with an Islamic aesthetic, is a clear attempt to “Middle Easternize” one of Turkey’s most European neighborhoods. Erdogan has been trying hard to ignore the protests, talking about issues such as the comprehensive restrictions on alcohol passed two weeks ago—another attempt to sweep Turkey’s secular image under the rug—or delivering a long address to the nation about the state of the economy on Friday as clashes began to break out. His team of spin doctors has no doubt advised him to portray the whole issue as a minor, isolated disturbance brought on by a few disgruntled extremists. The very idea that large numbers of Turks could be so disgruntled with Erdogan’s rule doesn’t fit into his vision of Turkey. Being able to handle disagreement has never been Erdogan’s strong suit; he has been known to surround himself with “yes-men” and there is practically no debate within his Justice and Development Party. But the prime minister’s strategy isn’t as far-fetched or naïve as it may seem. Between Erdogan downplaying the protests, the local media trying to ignore it, and the sheer size of Istanbul, most of the city doesn’t even feel the scope of the uprising, which is exactly what the ruling party wants. The districts where clashes are still going on are chiefly a handful of secular enclaves in the predominantly conservative Istanbul—so the regime may succeed in casting those marching as a few bad apples, even if they number in the thousands. Ultimately, the very nature of the ongoing protests may make them fizzle quickly: The heavy use of social media has allowed for useful tactical information to be exchanged quickly, but it also creates a cacophony of voices that keep any unifying overarching message from forming or standing out. The difference between an uprising and a revolution is discipline and planning, and without any real leadership or message, the protests may just proceed for a few more days of aimless slogan chanting, pot banging, and tear gassing. Until Erdogan believes his mandate is in jeopardy he probably has no reason to engage in meaningful compromise. In the end, all the Nika riots succeeded in doing was making Emperor Justinian even more paranoid for the remainder of his very long reign.